Guidonia Montecelio (Italian pronunciation: [ɡwiˈdɔːnja ˌmonteˈtʃɛːljo]), commonly known as Guidonia, is a town and comune in the Metropolitan City of Rome Capital, Lazio, central Italy. 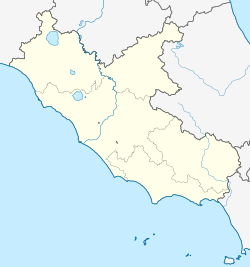 The municipality of Guidonia Montecelio, formed by the main towns of Guidonia and Montecelio, lies to the north-east of Rome, some kilometres from the Grande Raccordo Anulare - a ring-shaped motorway which forms a circle around the capital. The terrain of Guidonia Montecelio is mainly flat, and the community lies in between the Via Nomentana and the Via Tiburtina. It borders with Fonte Nuova, Marcellina, Palombara Sabina, Rome, San Polo dei Cavalieri, Sant'Angelo Romano and Tivoli. The hamlets (frazioni) are Albuccione, Bivio di Guidonia, Colle Fiorito, Colleverde, La Botte, Marco Simone, Montecelio, Pichini, Setteville, Setteville Nord, Villalba and Villanova. Montecelio was founded in 998 as a fortified castrum (Castrum Monticellorum). In 1915 the Regio Esercito (Italian Royal Army) built a major military airport in the area for its Corpo Aeronautico Militare (Military Aviation Corps), the predecessor of the Italian Royal Air Force founded in 1923. Guidonia was erected as a comune in 1937 by Benito Mussolini, its name chosen to honour the Regia Aeronautica general Alessandro Guidoni (1880–1928), who had died on 27 April 1928 while testing a new parachute at the air force facilities. Today the town is part of the Rome metropolitan area, with a massive presence of industry (mainly travertine caves and cement industry) and the service sector. The number of residents commuting to Rome is high, with transport in a critical situation. Guidonia is also home to Marco Simone Golf and Country Club, which will host the Ryder Cup in 2022.